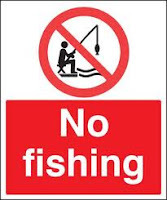 When the law tells you to fish with only one fishing rod, then you best follow the law and fish with only one fishing rod, lest you be prevented from fishing at all. Think we're joking? Then you need to hear the story of Viktor Liakh, who was banned from fishing for life after violating a court order. According to a story in Monday's Toronto Star, the 61-year-old Liakh of North York was spotted fishing at the Holland River in Bradford last May. Conservation officers from the Ministry of Natural Resources checked his fishing license and discovered he was under a five-year fishing suspension for casting too many lines in January 2010. Anglers are only permitted to use one line, according to Natural Resources conservation officer Doug Poirier. Turns out, Liakh violated this regulation by casting up to four lines into the water not once, not twice but four times between 2002 and 2009. For his latest indiscretion, Liahk was fined $3,000 and banned from fishing for life. Ouch. Worse, if he is ever caught fishing again, Liahk could face time in jail. Oddest help wanted ad ever! Shark officer?